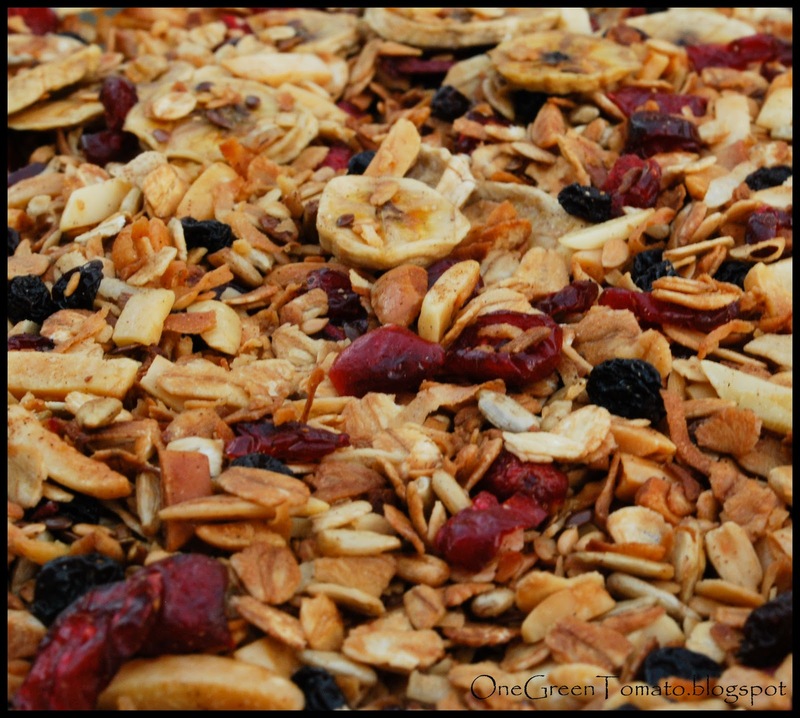 I’d like to introduce you to the latest addition in my morning granola rotation: Summer Berry! Yes, I know, sour cherries are not technically a berry, but the title “triple fruit” did absolutely nothing for me! Toast the oats in a 9×13 pan for 15 minutes at 300°F, stirring once. In a small bowl, combine wet ingredients and whisk until well blended. Remove the toasted oats from the oven and add remaining dry ingredients, except for the fruit, cinnamon and vanilla. Stir until combined, then evenly pour the oil-sugar mixture into the pan stirring well to make sure everything is well coated. Place pan back in the oven for 20-25 minutes, or until granola starts to brown around the edges, stirring once or twice. 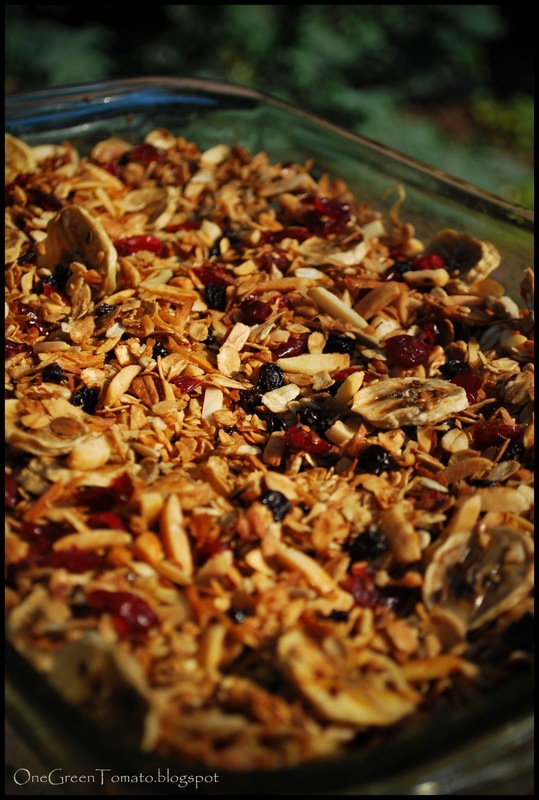 Be careful to not overbake your granola when using flax seeds. Not only will flax lose its beneficial health properties when over heated, but it will also develop a smoky flavor. Add dried fruit and stir. Top off with a sprinkling of cinnamon and vanilla. Allow to cool completely before placing into containers for storage. Several weeks ago I picked sour cherries for the first time. Since I had yet to preserve this fruit, I decided to try out various methods not knowing which would end up as my favorite. 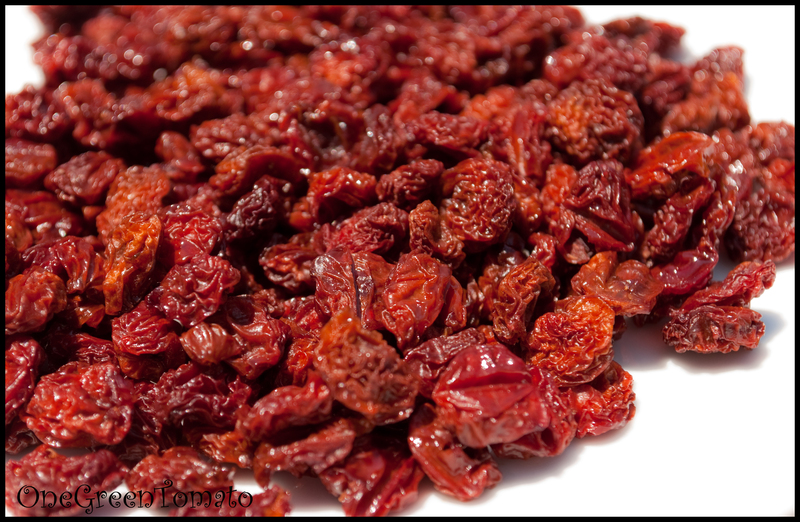 With the exception of cherry pie filling (because I LOVE pie), dried cherries have definitely won that title! Sour cherries on their own are packed full of flavor; once you dehydrate them, it takes the intensity level to a whole other playing field! Wash cherries, remove pits and stems. Arrange in a single layer on dehydrator trays and place on recommended fruit/veggie setting. I have an American Harvest and the temp for fruit is 135°F. Cherries, like strawberries, are mainly water, so it will take quite some time for them to finish. I checked mine every 2-3 hours and removed the raisin-like cherries as they were ready. I believe the total drying time was around 12-14 hours. Store cherries in an airtight container. Lancaster has a few hidden gems, one being Millers, an Amish food store smack dab in the middle of nowhere farmland. I’m talking old order Amish, no electricity, only kerosene lamps, straight pined clothing and thick THICK Pennsylvania Dutch accents. I was in awe the first time Jason took me there. Not because of the Amish, I’ve been around Amish my entire life, but because of their amazing selection of homemade granola. They must have had over 20 different varieties, and don’t get me started on the dried fruits! Several years ago the Miller family built a new store directly across from the original one. This one is three times as big! They now have a “walk-in” style refrigerated room and if memory serves me right they now have electricity. It’s been over a year since I last visited due to having two Mennonite bulk food stores in close proximity to my home, plus the trek across Lancaster County (depending on tourist season, which runs March – Jan) can take well over an hour! I do however need to visit soon and stock up on flame raisins. They. Are. Awesome. Granola is one of my favorite foods! Not only does it taste amazing but it’s easy peasy to make and a relatively healthy snack (depending on what you put in it, of course). Fall brings several flavors to the forefront of my mind, one being maple, the other, cinnamon. 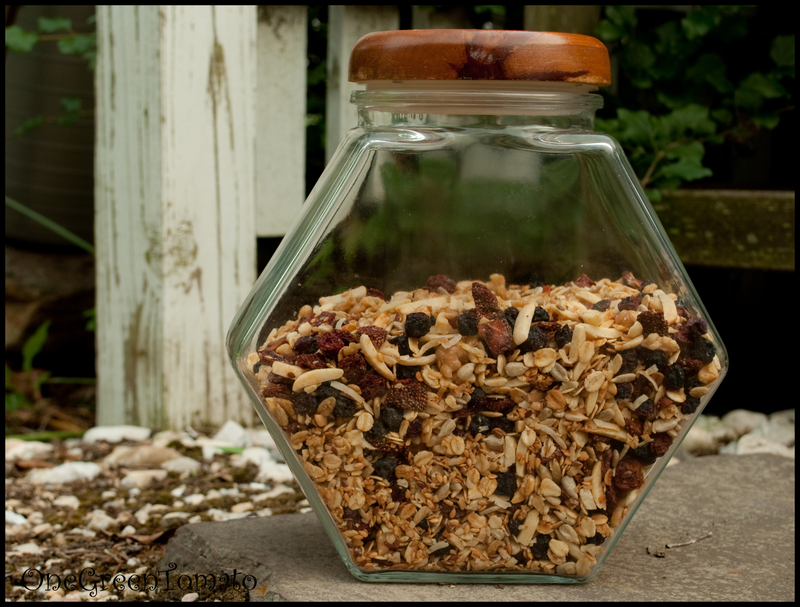 I decided to conduct a blog search for maple granola and found one that fit perfectly. Toast the oats in a 9×13 pan for 15 minutes at 300 degrees F, stirring once. In a small bowl combine wet ingredients and whisk until well blended. Remove the toasted oats from the oven and add remaining dry ingredients, except for the fruit and cinnamon. Stir until combined, then evenly pour the oil-sugar mixture into the pan stirring well to make sure everything is well coated. Place pan back in the oven for 20-25 minutes or until granola starts to brown around the edges, stirring once or twice. Be careful to not overbake your granola when using flax seeds. Not only will flax lose its beneficial health properties when over heated, but it will also develop a smoky flavor. Add cranberries, currents and banana chips and stir. Top off with a sprinkling of cinnamon. Allow to cool completely before placing into containers for storage.